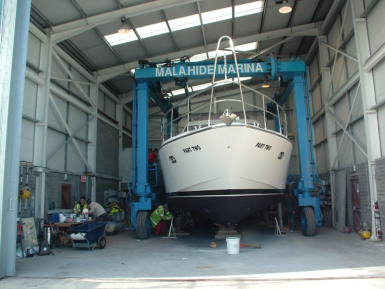 IIMS has organised a two-day training workshop of primary interest to large yacht and small craft surveyors on Monday 11th and Tuesday 12th March 2019 at Malahide Marina, just a few miles to the north of Dublin and close to the international airport. This is our first visit to Ireland for a number of years, so don’t miss this opportunity to refresh and learn some new skills too. The event is open to members and non-members and will be a mix of classroom presentations and hands-on surveying on boats in the marina using the available kit and technology. The classroom training is planned to take place at the marina, but subject to demand, it may be necessary to book a meeting room at an adjacent hotel for the classroom material. Delegates will be notified in good time if that change becomes necessary. The cost of the event is £140 (no VAT payable) for both days, to include all presentations, lunch, tea and coffee on both days. All delegates will be sent a certificate of attendance after the event and IIMS members may claim 5 CPD points for attendance. The schedule is subject to minor amendments and timing adjustments, depending on a presentation to be confirmed on thermal imaging. IIMS would like to extend its thanks to Damian Offer for making the Malahide Marina facility available for IIMS to be able to host this training workshop. IIMS is also grateful to those presenters who have agreed to speak for the benefit of delegates, some of whom are travelling in from the UK mainland especially with their kit. The venue is Malahide Marina Centre, Malahide, Co Dublin, Ireland. Telephone: +353 1 845 4129. Click to view the google map.